In 1979 our company was formed and incorporated in the town of East Haddam, Connecticut. Located along the Connecticut River just North of Essex. In 1998 we decided to re-locate to the City of Crisfiled, Maryland. Located on the Delmarva Peninsula just below Salisbury, Maryland. 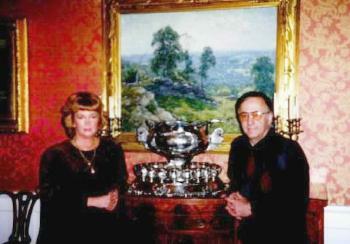 Pictured above are my wife Jan and I with some of the many pieces restored by us for the Governor's Mansion in Hartford Connecticut. We are very proud that our company had been chosen to restore these priceless treasures.